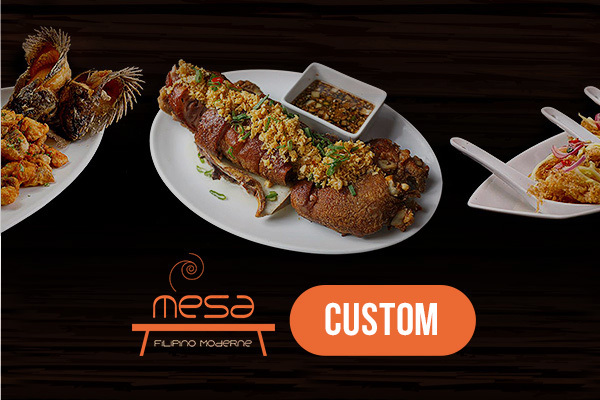 Home to the famous crispchon, Mesa is truly the go to for those who crave for an authentic Filipino flavor. Combining modern dining with traditional Filipino cuisine, Mesa offers all-time favorites that remind us of home, from kare kare, beef bulalo kaldereta, to sinigang, bistek bangus belly, escabecheng tilapia, and sisig. In the mood for an evening out with friends? Feast over several pampagana treats such as kilawing tangigue, scallops in garlic butter, tinapa rolls, or crispy tawilis with mangga. Those whose taste buds are craving for the smoked goodness of inihaw can delight in various barbecued dishes like pork, chicken, seafood, or a combination of all. Mesa also offers pancit canton, pancit palabok, bulalo, and crispy pata, among other native favorites.